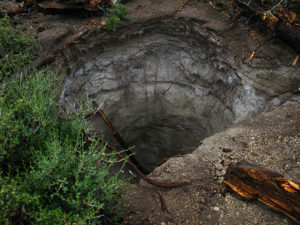 The Inyo National Forest has temporarily closed roads in the Bald Mountain area due to sinkholes that have made travel dangerous. This area is popular for off highway vehicle (OHV) recreation. The Bald Mountain Road (01S05) remains open. However, Roads 01S131, 01S131a and 01S131b are closed between the intersections of 01S70 and 01S05. Road 01S131 has a sinkhole in the middle of the road that is estimated to be 20 ft. deep. A vehicle got stuck in this sinkhole and driver reports that the ground gave way underneath the vehicle as they drove the road. There is at least one other sinkhole and numerous depressions (more than 30) forming in the vicinity. Some of the sinkholes and depressions that are developing are narrow and deep and have the potential to be dangerous because they are covered in needles and leaves, making them hard to see. Bald Mountain is in a beautiful Jeffrey pine forest. 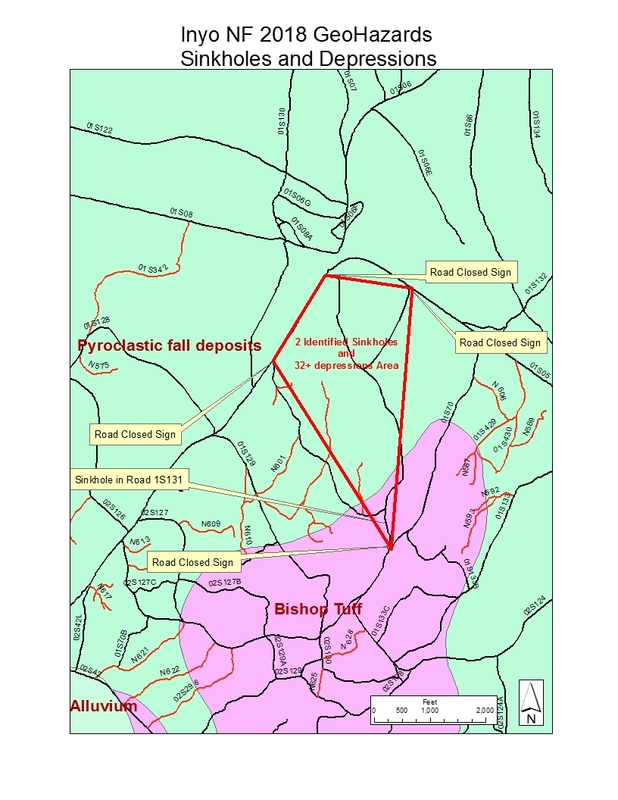 The forest is working with the U.S. Geological Survey (USGS) to assess and monitor the area to determine what geologic phenomena are at work in the area. The location contains organic material on the surface. 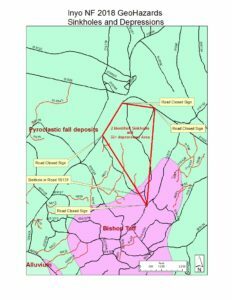 The subsurface geology contains highly permeable pyroclastic ash flows, Bishop Tuff, and basalt bedrock, which may contribute to the instability in the area. Based upon this assessment, the forest will determine a long-term strategy. The forest has put up signs for this closure area. If travelling in the nearby vicinity, please use extreme caution since the extent and nature of the sinkholes and depressions is not yet mapped or understood. Maybe this is a sign that the person who slashed and beat the horses at the Big Pine Saddle Club will soon be identified and captured and we’re supposed to dispose of him/her in the deepest darkest of the sinkholes.